Yes, that IS a tiny bottle of celebratory whiskey. I couldn't have done it without the help of my wonderful friends and family - especially my friend Tyler who has helped with everything from design brainstorming to booth building. I'm so lucky to have such amazing people in my life. I'd also like to extend a sincere thank you to Katie Hunt and everyone else affiliated with Tradeshow Bootcamp for giving me the tools - and confidence - to get here. You guys! I am so unbelievably excited to finally share this news! Near Modern Disaster has been selected to partner with West Elm and their LOCAL initiative! I'm packing up my first order for the Charlotte, NC store tonight. Also, I am dancing around my living room. It's times like these that I'm so happy my other company is a vintage postage shop. 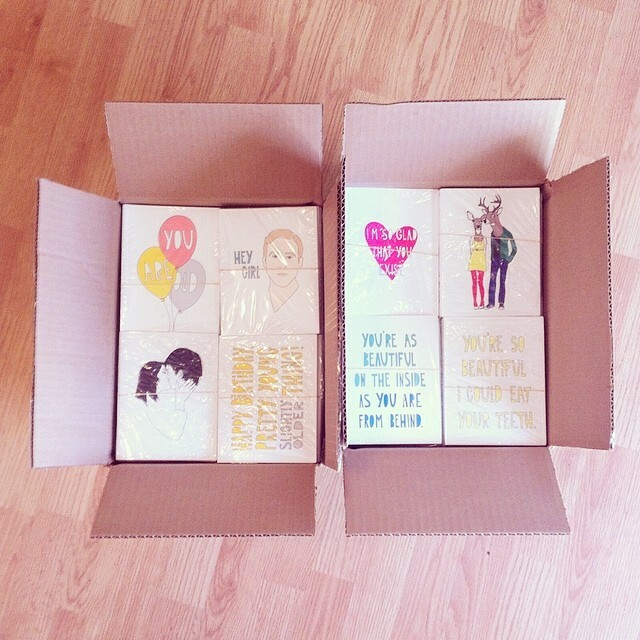 I raided the Pack & Post inventory and pulled an assortment of NY and heart stamps for my mailers. I'm so happy with how the envelopes turned out! Received the sweetest card today from my pals at Ladyfingers Letterpress congratulating me on having a card featured in the pre-NSS issue of Stationery Trends Magazine. Happy to report that my card is featured in the pre-NSS issue, the NSS issue, AND the NSS lookbook! Yeah, that's right. It's a card about butts. Spent the night assembling our pre-show mailers for the National Stationery Show. How is it almost May?! 2000 shiny new note cards arrived today - the first of many orders to build up my inventory. Three cheers for local printers with free delivery! Ten thousand cheers for me no longer printing everything in-house!